I usually write my weekly STAR TREK: DISCOVERY review editorials on Fridays and Saturdays after the new episodes premiere on Thursday night. But the family and I are leaving on tonight for the weekend. So I’ve decided to pre-write my weekly blog—not about the latest episode—but about a character who is rapidly becoming my favorite starship captain in Star Trek: actor ANSON MOUNT’s portrayal of Christopher Pike. It was literally the last thing I expected going into season two. I mean, I hoped that the show would course-correct after the disappointing and often frustrating season one (at least in my opinion, but I’m not alone). I was curious to see how they’d handle Pike and some of his crew—Number One, Dr. Boyce, Yeoman Colt, and of course good ol’ (young) Spock. But never in a million years would I have predicted falling in love with Captain Pike and having him rapidly take his place as my favorite Starfleet captain! Granted, it’s still early. We’ve only had 7 or 8 episodes featuring Pike…versus a hundred hours of Kirk, nearly twice that for Picard and Sisko and Janeway, and about the same amount for Archer. Upcoming episodes could ruin the character or make me start counting the minutes until Pike goes back to the Enterprise. Part of the reason I like Pike (and so do MANY others) so much is the outstanding performance of Anson Mount. He really is an amazing talent…and if you haven’t watched his previous series Hell on Wheels, then you are missing some amazing television and yet another awesome character. But it’s not just that Pike is being played by a top notch actor. William Shatner, Sir Patrick Stewart, and the others are all stellar performers portraying iconic captains. So why have so many fans (even ones like me who couldn’t stand Discovery a year ago) fallen in love with Captain Pike so quickly? In season one, many readers wondered if I was just a “hater” and wouldn’t like anything I saw on STAR TREK: DISCOVERY no matter how good it was. But so far in season two, Discovery has been batting .667 with me, with four positive reviews and only two episodes so far that I felt warranted criticism. So now that we’ve reached the halfway point of season two and the search for Spock has finally moved into the “found him!” stage, what did I think of the seventh episode, “Light and Shadows”? Yep, I loved this episode. For a second week in a row, I watched through the entire episode without stopping or stepping away. I was completely engrossed, and the episode seemed to pass so quickly! Of course, I should note that this was also the SHORTEST episode of the season so far, with a run-time of just 40 minutes. For comparison, the season premiere was a full hour, episodes 3-5 were about 50-52 minutes each, episode 6 was 56 minutes, and only episode 2 was under 50 minutes (only 44 minutes). So this latest episode was definitely a short one (which also means less expensive to make…but don’t tell anyone!). Section 31 where the things they have done are taking me to Talos IV. So keep on Spockin’ me, baby! Keep on Spockin’ me, baby! Look, up on the bridge! It’s a tall, thin alien! Who came to Starfleet and proceeded to learn 90 different languages. Fights a never-ending battle for balance, blueberries, and the Starfleet way. Ever since last June when Discovery show-runners Gretchen Berg and Aaron Harberts were reportedly fired because of cost overruns and also for mistreating the staff writers, fans have been waiting to see what new showrunner and Trek Tsar Alex Kurtzman would do to the series. Would he be the savior who finally straightened out all of the problems with Discovery that made it feel, to many fans, like the show was NOT Star Trek? Or would Kurtzman proceed to screw things up even worse? Does Kurtzman even “get” Star Trek (as he claims to be a true Trekkie)? After all, this was one of the three writers of Star Trek Into Darkness, a film many fans felt was the worst and weakest of the three reboot Trek movies. Was Kurtzman to be Discovery‘s salvation or ruination? We would all find out with the sixth episode of season two, Kurtzman’s first episode as showrunner…. After four very positive reviews from the guy known for his generally critical reviews of STAR TREK: DISCOVERY‘s first season, some of my readers were beginning to wonder if Jonathan had been replaced with an alternate universe doppelgänger. Not this time, though. “Saints of Imperfection” was just that: imperfection. Now, it’s not that I expect every episode of Discovery to be” perfect”—that starship sailed long ago!—but this one was far from it. In fact, it regressed into a lot of what I used to complain about often in season one: sloppy and lazy writing, rushing to “hit the beats” without giving characters or viewers a chance to emotionally process all that’s hurtling at us, unbelievable plot contrivances, predictability, and a host of other annoyances (at least in my book). Granted, this was the final episode produced under the supervision of former show-runners Gretchen Berg and Aaron Harberts, who were reportedly fired because of cost overruns and also for mistreating the staff writers. Both reasons are very evident in this episode. 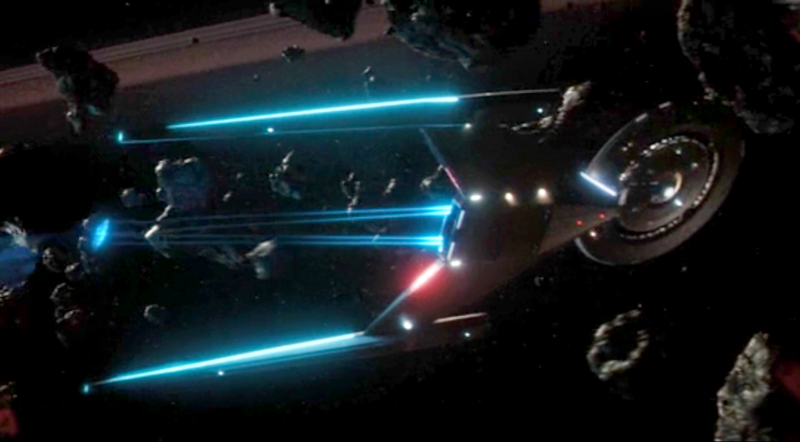 Although the VFX looked gorgeous and could easily win an Emmy later this year, I can understand why the budget for Discovery was blown. And while I love watching exciting VFX, I much prefer a good story with characters I care about. And that brings us to the writing, which surprised me because the writer, Kirsten Beyer, wrote the strongest episode of season one, “Si Vis Pacem, Para Bellum” (the one on the forest planet where Saru freaks out), and is also the only staff writer who has several published Star Trek (Voyager) novels. In other words, Kirsten knows her Trek and her writing. So what happened to so totally derail this episode and backslide into many of the old problems of season one? Admiral, there be SPOILERS here! At first, I was going to title this blog “Has STAR TREK: DISCOVERY Finally Got Its Groove Back?” Then I realized that it never really had a grove during season one…at least for me. 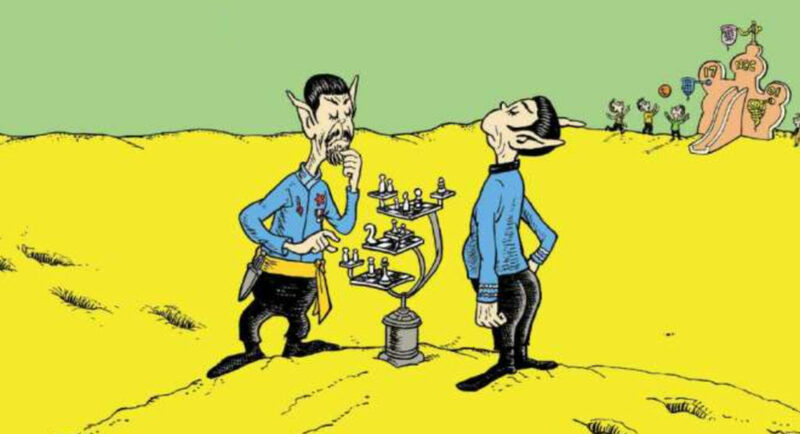 Yesterday, I updated you that on Thursday at 1:30pm Pacific Time, the two parties in the DR. SEUSS/STAR TREK mash-up lawsuit will meet in Federal Court in San Diego, CA. The original complaint was filed more than two years ago, and after countless motions, discovery, and an emotional rollercoaster of rulings from the judge, this hearing is likely the last time the two parties will appear before the judge until the trial begins. Assuming there is a trial. Barring a surprise last-minute settlement (which, I think, is highly unlikely), Thursday’s hearing could very well result in either the case being dismissed by the judge or else sticking a knife into the defense team to make the lawsuit all-but-impossible to win. But assuming the case goes before a jury, and if I were a a juror, what argument(s) would be most likely to persuade me that Oh, The Places You’ll Boldly Go! deserves the freedom to be published? What exactly should the defendants have licensed? Think about it. 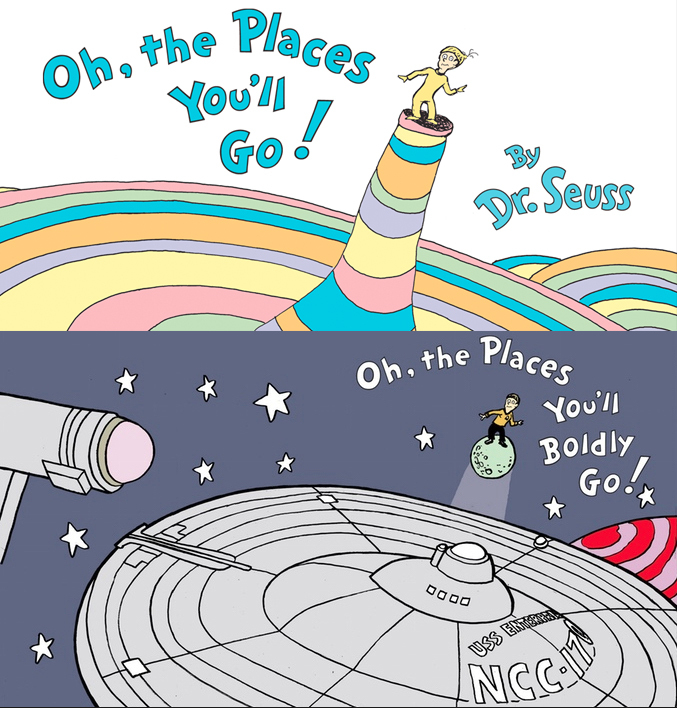 If the book had been The Cat in the Hat Knows a Lot About Star Trek, then the answer is straightforward: they’d license The Cat in the Hat. If their story was Mr. Spock Meets the Grinch, then they’d license the Grinch, Max, and maybe Cindy Loo Who. But which Dr, Seuss character did David Gerrold, Ty Templeton, and ComicMix use without permission? The best that the plaintiffs could come up with is the “boy” (their word) who appears on the cover and throughout the original Go! book. However, as with other characters in the Boldly book, this “boy” has been transformed. He wears a TOS command tunic and black pants instead of pajamas. Is that still the same character? The two Zaxes were turned into Spocks. The guy with the Sneeches’ star-machine was turned into Scotty with a transporter. When does a copyrighted character get changed enough that he becomes a new creation? It’s an intriguing question! 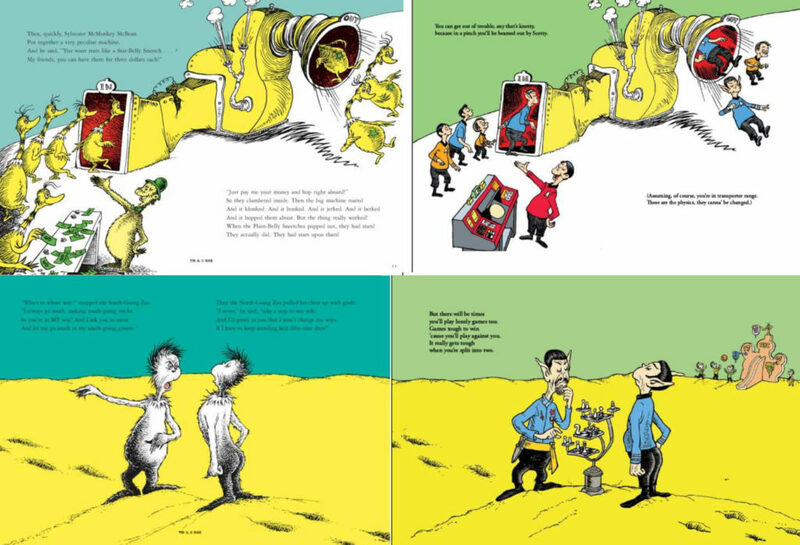 This Thursday at 1:30pm Pacific Time, the two sides in the ground-breaking DR. SEUSS/STAR TREK mash-up lawsuit will meet in front of Ninth Circuit Federal Judge HON. JANIS L. SAMMARTINO in courtroom 4D of the Edward J. Schwartz Courthouse in San Diego, California. Last month, I reported the hearing date as January 31. But the lawyer for the defense caught the flu and requested, and was granted, a one-week delay (which is not all that unusual). In a previous blog, I discussed the history of the case, and what each side is asking the judge to do. In short, the defense wants the judge to end the case before it begins next month…in favor of the defense, of course. 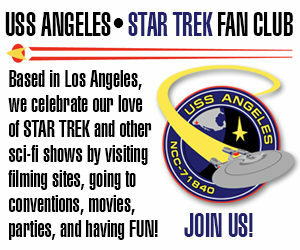 This would mean her ruling that their mash-up Oh, The Places You’ll Boldly Go! should be considered (as a matter of law) to be FAIR USE and therefore protected speech. Therefore, any copyright claims would be nullified, and Team Mash-up (DAVID GERROLD, TY TEMPLETON, and their publisher COMICMIX) would be free to publish their book without legal liability. Also, the defense wants the remaining two claims of trademark infringement (different than copyright) dismissed because it is not reasonable to trademark an artistic “style” nor the look of a typographic font. The plaintiffs, DR. SEUSS ENTERPRISES (DSE), are trying instead to convince the judge in this case to do the same thing that was done in the AXANAR lawsuit: declare that the mash-up is not Fair Use and, therefore, cannot be defended as such. Likewise, they want the judge to rule that, yes, it is reasonable to hold a trademark on an artistic style and a font. This wouldn’t necessarily end the case (unlike the defense motion,) but a favorable summary ruling by the judge would make the lawsuit all but unwinnable for the defense…as happened previously with Axanar. So why have I given this case so much attention? Along with much of the United States this past week, hell has frozen over yet again as Jonathan Lane writes a THIRD consecutive mostly-positive blog about STAR TREK: DISCOVERY! Granted, my first blog of season two was more noncommittal…yet hopeful. But my second blog was 100% raving praise. So what about the third episode, “Point of Light”? I wasn’t prepared to like it. In fact, after watching the manic first three minutes where the camera NEVER ONCE STOPPED MOVING (seriously, watch it again), I was feeling carsick…or maybe starship sick. 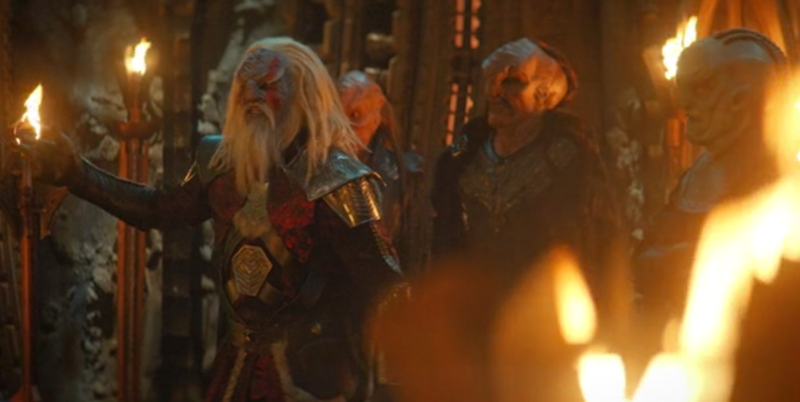 I knew the Klingons were coming this episode, and I really hated them and their incessant subtitles in season one. WARNING – There’s spoilers off the starboard bow! People seem to think that I only write negative things about STAR TREK: DISCOVERY…that I’ll never accept it and will always find something to criticize: uniforms, Klingons, lack of banter, etc. What can I say? I loved it. It felt like I was watching STAR TREK…possibly for the first time since Burnham and Georgiou walked across that desert planet at the beginning of the premiere episode. Nothing bothered me…not the uniforms or the “non-canon” console graphics or even Tilly. Heck, I didn’t even mind that the magic mushroom drive once again saved the day. When it’s good Star Trek—when it FEELS like good Star Trek—all the rest of the discontinuities with canon can be safely beamed out of my mind. So what made this feel like “real” Star Trek to me…? On Thursday night, I watched the season two premiere of STAR TREK: DISCOVERY, the episode”Brother.” I also watched the latest episode of The Orville just before because fate and network programming executives have seen fit that new episodes of both shows debut on the same night! For me, it wasn’t that simple. “It was good” or “it was bad” or “it was better than season one” or “it was closer to Star Trek” oversimplifies what I consider to be a very complex reaction to a show that is obviously hitting the “reset” button after its first season struggled to attract an audience. Discovery had to make a lot of course corrections for season two, and on some maneuvers it succeeded and leaves me hopeful—and for others, I sigh and shake my head as the show is still missing the mark…at least for me.